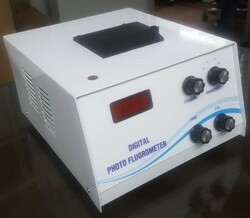 Pioneers in the industry, we offer digital photo fluorometer s-915 from India. · 3 Digits Bright Red Seven Segment Led Display. · High Stable & Accurate. · Adjustable In 4 Ranges. · Determines The Concentration Of Flurophors Quinine. · Highly Sensitive Wide Range Photodiode/Cell. Digital Flurometer S-915:- Determines The Concentration Of Flurophors Quinine. Full Scale Deflection Obtained With 1ppm Quinine Sulphate In 0.1 N Sulphuric Acid (Primary Wavelength 360nm) Primary Filters: Corning 5840 And Corning 5113 Mounted Holders. Secondary Filters: Corning 4308, Corning 3486, And Corning 3385 Mounted On Holders. It Is Used For Analysis Of Fluorohors Such As Vitamins, Quinine, Steroids, Fluorescein, Metal Complexes Etc.